Lake Victoria is the world’s largest tropical lake by area (cited from Witte et al., 2005). 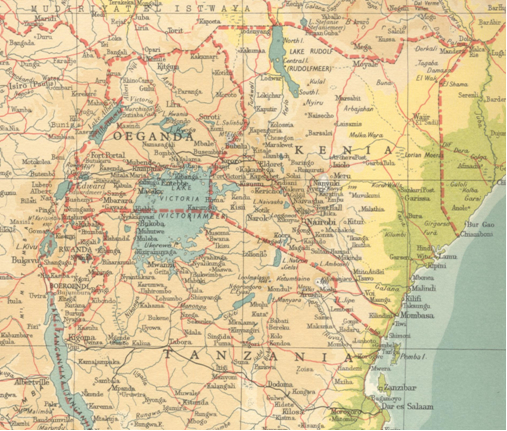 Bound by Tanzania, Uganda and Kenya, it straddles the equator in eastern Africa. Lake Victoria has a surface area of ca. 68,800 km2, a maximum depth of about 70 m and is situated at an altitude of 1134 m above sea level. The lake originated less than a million years ago and probably even dried up completely ca. 14,000 years ago (Johnson et al., 1996). In spite of its young age, Lake Victoria has had an extremely rich fish fauna, comprising over 500 cichlid species (Greenwood, 1974; Witte & Van Oijen, 1995; Seehausen, 1996; Kaufman et al., 1997), making up more than 80% of the total fish mass (Kudhongania & Cordone,1974). The remaining 20% comprised ca. 45 species divided over 11 families (Greenwood, 1974; Van Oijen, 1995). The cichlids in Lake Victoria belong to two tribes: the Tilapiini, with only two herbivorous species that grow to an adult size of more than 25 cm standard length (SL) and the Haplochromini with more than 500 species. Haplochromine cichlids generally do not grow larger than 15 cm SL and comprise specialists to virtually every possible food source in the lake (Greenwood, 1981; Witte & Van Oijen, 1995; Seehausen, 1996). In the 1970s, detritivores / phytoplanktivores made up ca. 50% of the total fish mass and zooplanktivores ca. 25%. Piscivorous species made up less than 10% of the total ichthyomass (Goldschmidt et al., 1993). 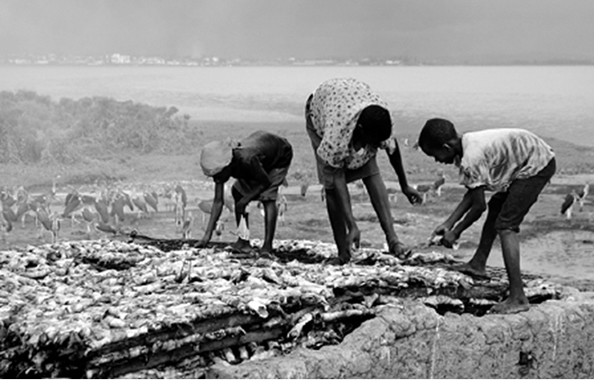 The total annual fish catch in Lake Victoria in the 1960s and 1970s approximated 100,000 tonnes (Reynolds et al., 1995). 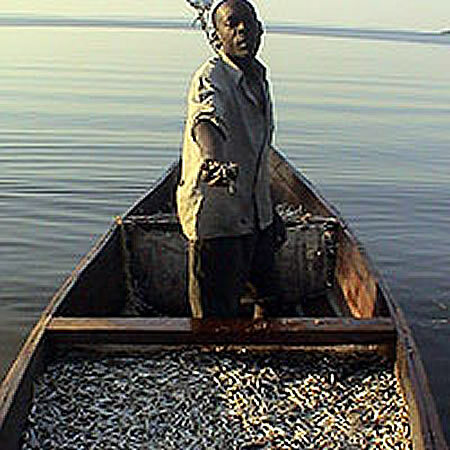 From time, immemorial, fishing has been carried out in the coastal areas of Lake Victoria. Lakewide, the main target species was the tilapiine cichlid Oreochromis esculentus. As a result of decreasing catches, exotic tilapiine cichlids were introduced into the lake in the 1950s (Beauchamp, 1958; Welcomme, 1967). In the same period, a huge predator, the Nile perch (Lates niloticus), was introduced illegally. 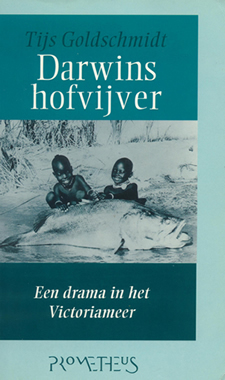 Later, between 1961 and 1963, Nile perches from Lakes Albert and Turkana were officially released (Arunga, 1981; Welcomme, 1988) in spite of fierce opposition (Fryer, 1960). During the first few decades after these introductions, the alien species did not boost fishery. Because of the continuing decline in the catches, fishermen increasingly used small mesh sizes and so, smaller, thus far under-exploited, species were caught (Balirwa et al., 2003). Due to the heavy fishing pressure, haplochromine catches declined locally in the Mwanza Gulf (Witte & Goudswaard, 1985). 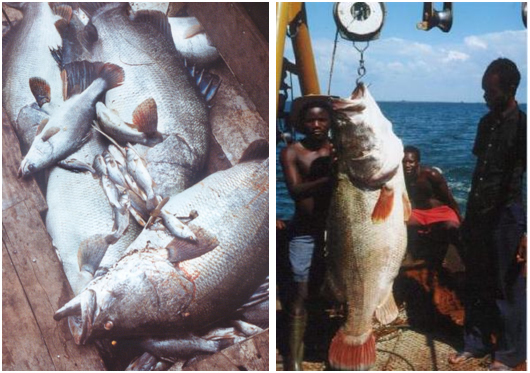 When the Nile perch boomed at the beginning of the 1980s, the decline of the haplochromines increased and became a lakewide phenomenon (Barel et al., 1985, 1991; Ogutu-Ohwayo, 1990). By 1987, the haplochromines had disappeared almost completely in waters of more than 6 m deep and Nile perch made up more than 90% of the bottom dwelling fish mass (Barel et al., 1991; Witte et al., 1992b). Concomitant with the decline of the haplochromines, increases in densities of invertebrate species such as midge larvae and mollusks were observed. Also an increase in algal blooms, particularly cyanobacteria, was observed in several areas of Lake Victoria during the 1980s (Ochumba & Kibaara, 1989; Witte et al., 1992a; Mugidde, 1993). The Nile perch explosion in the 1980s has contributed through a bottom-up and a top-down effect to an increasing eutrophication. Unlike the small haplochromines, the relatively fat and large Nile perches could not be dried in the sun. Therefore, they were chopped into pieces and fried in their own fat (Ligtvoet et al., 1995). The smaller Nile perch were mainly smoked. As a consequence, fish smoking became more common in the area. For frying and smoking purposes, firewood was needed, which enhanced the deforestation along the lake’s shore, thus increasing land erosion and eutrophication of the lake. Apart from this bottom-up effect, there was also a top-down effect. Pryor to the ecological changes, phytoplanktivorous and detritivorous fish (mainly haplochromines, which could digest cyanobacteria) made up respectively ca. 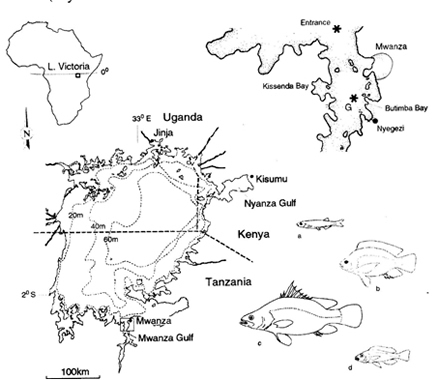 17% and 30% of the total fish mass in the sublittoral area of the Mwanza Gulf (Goldschmidt et al., 1993). After the decline of the haplochromines, the impact of phytoplankton grazing by fish in the Mwanza Gulf was negligible. (However, the precise impact of the disappearance of phytoplanktivorous fish on the phytoplankton densities and composition is not clear; for a proper estimation of this impact, data are needed on phytoplankton production and on phytoplankton intake by other organisms before and after the ecological changes). Transmission of light by water is dependent on the wavelength. Bodies of water that do not contain much organic matter absorb violet and red light much more than light of intermediate wavelengths (Levine & MacNichol, 1982; Loew & McFarland, 1990). Hence, Lakes Malawi and Tanganyika get bluer with depth. Waterbodies, such as Lake Victoria, containing yellow-green phytoplankton and dissolved organic matter, absorb light of all wavelengths more strongly than clear water. However, the short wavelengths (violet and blue) are most strongly absorbed and yellow-green light becomes increasingly dominant with depth. The increasing eutrophication in Lake Victoria may have caused further shifts towards longer wavelengths. Light measurements in spring 1987 revealed that mainly orange-red light penetrated over mud bottoms at depths of more than 10 m (de Beer, 1989). Transmission spectra measured in 1996, at a water depth of 2 m at 13 research stations near rocky shores, showed a decrease of the width of the transmission spectrum with decreasing transparency (Seehausen et al., 1997). The peak of the transmission spectrum was near the yellow-orange light.